President Obama and his allies have made no secret about their immigration goals: easy amnesty, loose enforcement, and ever-higher levels of legal immigration. One prominent labor leader has boasted that continued mass immigration "will solidify and expand the progressive coalition for the future." In this penetrating Broadside, Mark Krikorian lays out the details of Obama's open-borders approach to immigration and its political consequences. 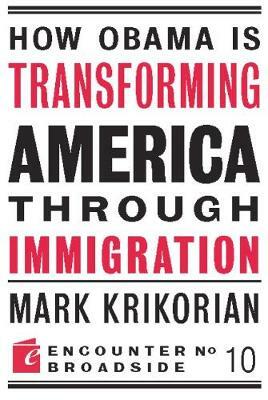 Krikorian, one of the leading critics of current immigration policy, examines the Administration's record of weakening enforcement and describes how legislation crafted by the president's supporters in Congress would ensure new waves of illegal immigration. Krikorian also explains how continued high levels of immigration, regardless of legal status, would progressively move the United States in the direction of more government and less liberty.